The $67,500 scholarship program, titled “Future You Powered By ANL”, provides $7500 per annum to each of the three students for the full three years of their study. AMC Principal, Professor Shuhong Chai said the scholarships would help nurture the next generation of logistics talent and built upon a strong, longstanding relationship between the two organisations. “Around 90 per cent of world trade is moved on the oceans and developing a strong, skilled workforce is essential to keeping the multi-billion dollar international logistics industry afloat,” Professor Chai said. This new scholarship program from ANL Container Line will provide three students with the opportunity to further their education in this growing field, allowing them to immerse themselves in their studies and make the most of personal and professional development opportunities. 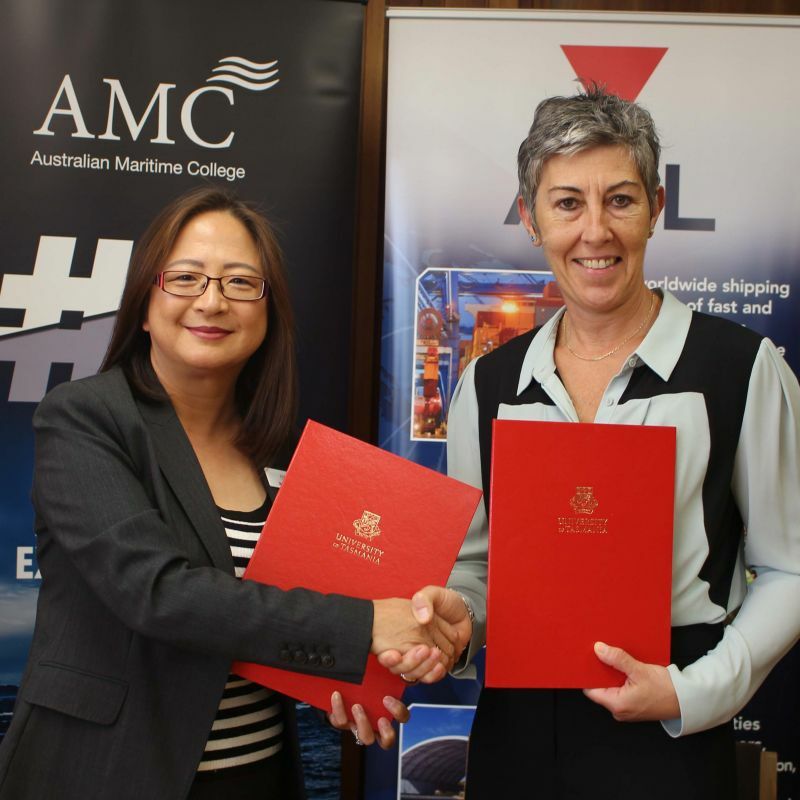 Pascale Toussat, General Manager – Human Resources/Office Administration Australia & New Zealand ANL Container Line added: “This scholarship program is another proud step forward with AMC. ANL is a big supporter of talent development not only for our business but our industry. “Shipping and Logistics are such an important part of our economy as an island nation. While our core business is shipping, we have broadened our offer in recent years, offering door to door services and other more technical solutions to our customers. The scholarship MoU signing was followed by the 2019 AMC Careers Expo, in which students had the chance to network with national and multinational industry leaders and investigate their future career options. Representatives from prominent Defence, engineering, logistics and shipping organisations attended the two-day event, which also featured presentations on industry graduate programs, resume writing and interview skills. “We were pleased to this year welcome a record number of 22 exhibitors to the event, which helps reinforce Launceston’s reputation as a breeding ground for high-quality, job-ready graduates,” Professor Chai said. "The qualifications that AMC offers, spanning the disciplines of coastal and ocean seafaring, maritime engineering and global logistics management, correlate closely with global demand and lead to excellent outcomes for our graduates." The exhibitors were: BAE Systems, McTaggart Scott Australia, Naval Shipbuilding College, Moog Australia, Navantia Australia, Thrust Maritime, Serco, Department of Defence, Woodside, Austal Australia, Trident LNG Shipping, ANL Container Line, Oldendorff Carriers, Defence Force Recruiting, Maritime Survey Australia, Wallbridge Gilbert Aztec, Naval Group Australia, BMT, Subsea 7, Inchcape Shipping Services, CSL Australia and Australian Maritime Technologies Pty Ltd.
(Photo): AMC Principal Professor Shuhong Chai and ANL Container Line General Manager – Human Resources/Office Administration Pascale Toussat launch the scholarship program.